It figures, that the one time I set my mind on a sweater that someone else thought up- it would be one that is out of print and not available on most store shelves. The Urban Aran- Patons “Street Smart” booklet #500989. 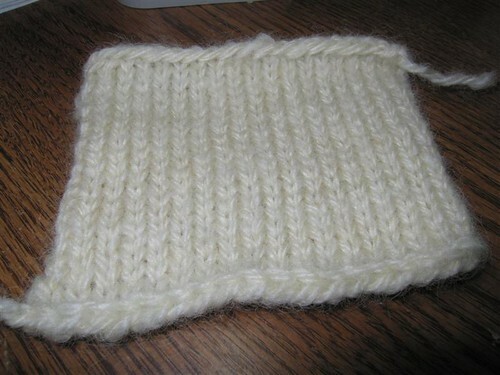 And here is my little gauge swatch (Isn’t it cute?) It really is square- it just looks warped in the photo. 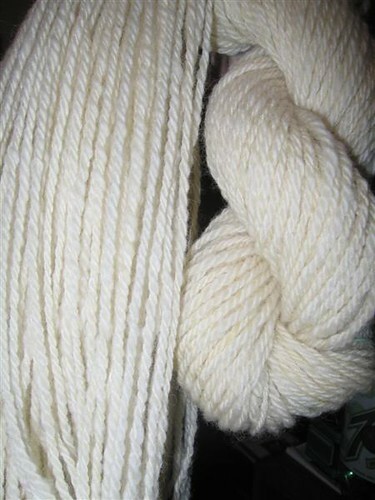 I think that the reason I’m so enamored of this swatch is because it just looks so pristine and neat and tidy, and I can remember when the fleece it’s made from was dirty and stinky and laying out on the driveway after I hauled it out of the feed sack it was stuffed in. Quite a transformation!